It’s been a busy time for zine workshops, which combine my research focus on the role of culture in reproducing and transforming inequality along with my experience as a cultural worker. In addition to a January visit to Franklin & Marshall College to hold my second-annual Feminist Zine Making workshop (sponsored by the Alice Drum Women’s Center, Philadelphia Alumni Writers’ House, and the Shadek-Fackenthal Library, I’ll be presenting at the NY6 Spectrum LGBTQIA Conference in Saratoga Springs, NY, in late February. As a race-critical cultural sociologist, I’m very interested in how certain forms of authorship–and certain cultural artifacts–continue to be relevant in an era that seems to have moved on. Like, in this digital age, where Tweets and blogs and Tumblrs are simple ways to share your voice, your point of view, and your vision, why would something as seemingly retrograde as a zine (self-published paper booklet) even matter? 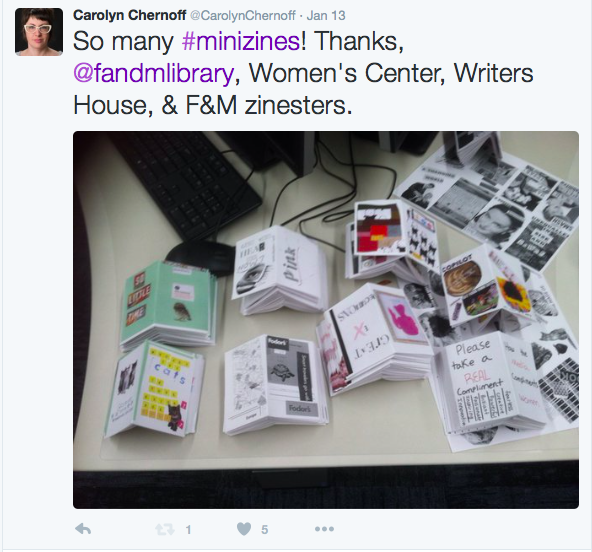 But zines matter. Culture matters. Culture is everyday, and culture connects us to the past, present, and future. Want to chat about culture, zines, or other pop contradictions? I’m listening.